Danielle Crampsie pioneered an entirely new kind of jewelry, but fell behind the wave of competition that followed. Danielle custom engraved jewelry pieces with the soundwave of an audio track sent by the customer. At first, business came easy, as she was the only one in the market doing this kind of work. Featured spots on Buzzfeed and Lifehacker helped her publicity as well. But then, a wave of copycats made cheaper, low quality versions of her idea. To stay relevant, she had her website redesigned. This was a fatal decision, as the new design was poorly thought out, and lead to a steep drop in sales. Several months later, she turned to JMarketing to help turn things around. We saw that her website was not setup to sell and the designers lacked understanding of consumer psychology. We set out to design a new website optimized for conversions by connecting to buyer emotions and positioning Danielle as an industry leader. 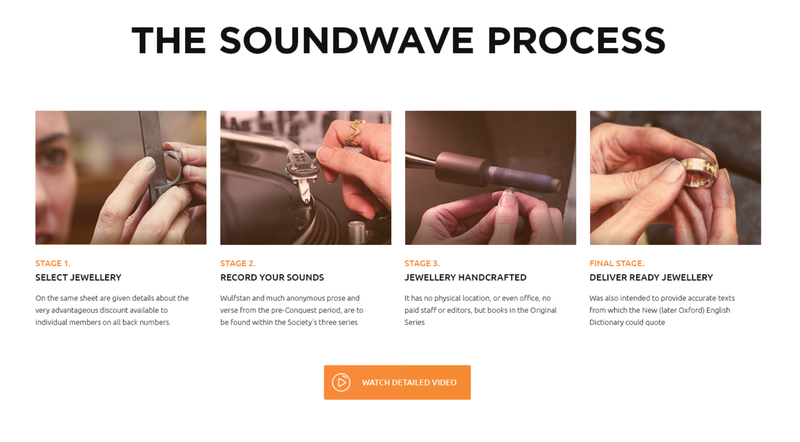 We used the header to make a striking first impression with the viewer, setting apart Soundwave Jewellery from the cheaper competition. The background is a series of video shots that show the jewellery being crafted by hand. Then we used the copy to tell the story of the product. This is a piece that “immortalizes a precious moment in time. It could be your child’s first words, it could be a marriage proposal.” This helps the customer envision what their product could look like and what it would mean to them. Along the bottom we callout social proof points to increase the brand authority as an industry leader, far beyond the competition. This ensures the viewer that their money is well worth it, decreasing buying friction and increasing sales. Down the page, we presented each of her products with beautiful imagery. In addition to the rings presented here, there is also a section displaying necklaces, earrings, and other jewellery. This was a clear, visual way of helping the viewer understand exactly what their options are. If this process is at all difficult, as it was on Danielle’s old site, customers will often get frustrated and leave. By creating a seamless process, we increase the odds that the viewer will turn into a sale. The process section is meant to put customers at ease by making the brand feel familiar to them. Especially considering the high price tag of these products, we can’t expect them to make a purchase if they don’t know exactly what they’re getting into. This decreases the perception of risk, which increases the odds on conversion.